“I can see you really want my attention right now. I love you and I don’t have time right now but I’m looking forward to our special time at 7:30.” (Of course, this requires advance planning to make sure you have set up scheduled, special time with your children. 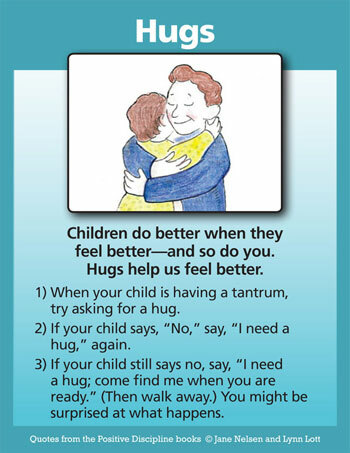 There are many other possibilities to make a connection and to help children feel better so they’ll do better. However, the main point is to see all of the Positive Discipline Tool cards NOT as techniques, but as principles. Techniques are very narrow and often don’t work. A principle is wider and deeper—and there are many ways to apply a principle. Go into your heart and your wisdom and you’ll know how to apply the principles of connection before correction, focusing on solutions, empowering children—and hugs—that are even better than the examples. This is very true. My kid loves being hugged. And he's a hugger as well - you can see it when he enthusiastically hugs other people. And he doesn't give just a normal hug. He gives hugs with pat on the back. And that is coming from a 2 year old. I usually ask my children, "Do you need a hug?" They tend to fire back "No!" if I ask for one, because at the moment they're upset, it's all about them and their very big feelings. If I offer them a way out, by offering a hug -- they usually will stop and come and give me a hug. Then I can say, "I understand you are upset, but we don't bite people. Next time you can try saying, 'I don't like it when you take my toy' and walking away." I try to provide them with the words to use, because they act out physically when they don't know what else to do. How can we just say "Stop that" and not teach them what TO do? That's so confusing to small children.